Usually, I compose my blog via online web server, that mean I like sign in my account and write something. As I like use web mail server to compose my email, same reason that I do not want open two applications same time and waste my RAM. 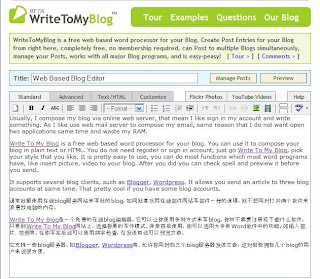 Write To My Blog is a free web based word processor for your blog. You can use it to compose your blog in plain text or HTML. You do not need register or sign in account, just go Write To My Blog, pick your style that you like. It is pretty easy to use, you can do most functions which most word programs have, like insert picture, video to your blog. After you did you can check spell and preview it before you send. It supports several blog clients, such as Blogger, Wordpress. It allows you send an article to three blog accounts at same time. That pretty cool if you have some blog accounts. I could not use old blog version to send my blog that cause Write To My Blog says new version much stable. But I do not like new version.